Showing results for tags 'UND'. Before last weeks debacle at USD, I would have thought UND would be favored for a solid win vs MSU. Now I am not so sure. Was the USD game an aberration caused by overconfidence on the part of the team and the staff? Did it expose some flaws in the team, maybe or maybe not caused by injuries? Was the staff a little lax in the preparation of the team? At this point I vote that last Saturday was the 'perfect storm' caused by overconfidence, injuries, and running into a really 'hot' opponent with a chip on its shoulder that played a great game. I think Schmidt will have a better plan to deal with a depleted defense and MSU will score less than 24. I am sure Rudy(encouraged by Bubba) will be putting together a game plan to control the clock and make it easier for the defense. Taubenheim needs to be better with his kicks and Santiago needs to have more good returns. I say Olivera has another big game vs MSU and we run for 250 plus as a team. Studsrud and the receivers have a better game and he passes for 200 plus. Defense has a td and finds a way to stop Murray. No more than 5 penalties and we convert 70% on third down. UND 27-21. Anybody else receive the e-mailed fan survey from UND/REA? Mine arrived Tuesday afternoon, and showed up as coming from fans@theralph.com. The survey was quick and straightforward enough; it covered MH, M/WBB, VB and FB and hit on everything from in-game experience to concessions to parking. My only beef is that it never asked me to provide contact information for the raffle. 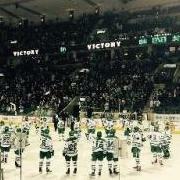 First conference game in Fargo or Grand Forks? Since NDSU got its way with two home games (2015 and 2019) vs UND and none in GF, where will the first Missouri Valley Conference game be played in 2020? Will the MVC see the injustice and give the game to Grand Forks or will they favor the older member of the conference and play a third straight game in Fargo? NDSU's insistence that both games under the current deal be played in Fargo may backfire on them when the MV chooses Grand Forks for the first game that really means something.. In a column/article about UND hockey, longtime Herald sports writer Tom Miller dropped this bomb: Really, Tom? You had to go there? It's 2017. We're several years removed from the previous regime, we've grown, we've matured, we've tasted success, we've made the playoffs, and we are full of hope and optimism for the first time in a long time. Yet, you had to take a snipe at the previous coach? By name? Show some class. The writer here could have used big boy words and made several creative or witty allusions to the recent down period for UND football. He could have indirectly referenced Mussman a million different ways, and all of the readers in Siouxland would have gotten the joke, and maybe even smirked a little. He could have taken the high road and tied FB attendance to fan apathy or performance generally, instead of calling out a coach or a staff. This was small, petty, and mean. And bush league journalism. Okay for Deadspin, I suppose...maybe that's where Tom's aspirations lie. The Herald is blessed to have such an excellent sports writer in Brad Schlossman...I only wish the same could be said for his colleague and understudy. Boo, Tom. Boo. http://www.undsports.com/ViewArticle.dbml?SPSID=58577&SPID=6390&DB_LANG=C&ATCLID=209884514&DB_OEM_ID=13500 A lot of hockey pedigree in the crop of new recruits coming in for 2015: Kennedy Kidd - Father, Trevor, played hockey with the Calgary Flames, Carolina Hurricanes, Florida Panthers and Toronto Maple Leafs, and was a member of the Canadian team that took silver at the 1992 Olympic Winter Games. Riley Koberinski - Father, Scott, played hockey at UND from 1985-89. Meghan Lindsay - Uncle, Derek Laxdal, played hockey for the Toronto Maple Leafs and New York Islanders and is the current head coach of the Texas Stars (AHL). Bella Mantaro - Father, Jason, played hockey at the Air Force Academy. Olivia Swenson - Lettered three years in hockey and two years in lacrosse at Chaska HS. Single Game Tix On Sale TODAY! Just a friendly reminder that single-game tickets for your Defending National Champion UND Fighting Hawks Men's Hockey Team went on sale today. BONUS REMINDER: This would be a great opportunity to redeem those Ticketmaster settlement discount voucher codes you might not even remember or know you had. If anybody needs help locating such codes and/or redeeming them, post a request here and I'll give you a quick tutorial BEFORE you check-out at the TM site.